This past week has been the hardest in recent memory. 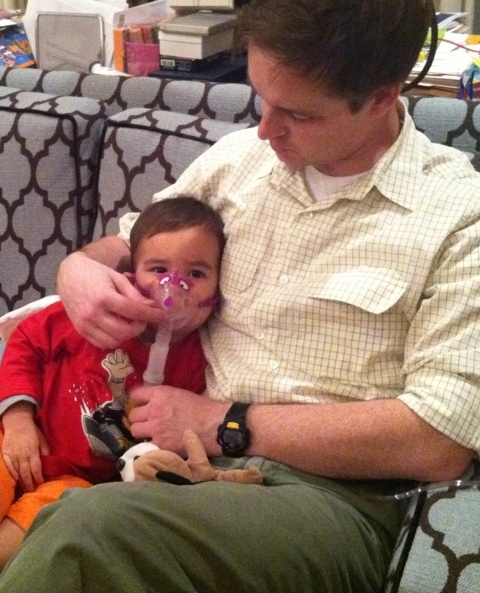 Jack got sick over the weekend and a trip to the doctor on Monday morning confirmed he had RSV. Blah. I had to go to 4 drugstores to purchase nebulizer, and poor J started breathing treatments that night. I was impresses with Boom’s thought to make the treatments kinda fun, instead of just muscling through, like I figured we’d have to. The poor DD got the RSV – the doctor did tell me to keep he boys apart, on different rooms. That is just super easy to do, with 2 babies. 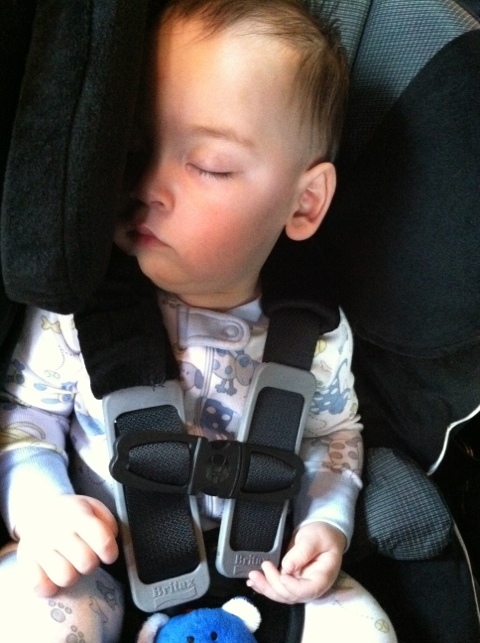 Here he is on the way home from the doctors… So tired! Wednesday and yesterday were super hard – I was thrown up on more times than I can remember and I was in tears at least once. I do think the worst is past us, thank goodness. Boom was seriously concerned for my mental health. As he always says, it is a short ride to crazy town for me. I just want everyone to feel better and be my normal good boys! My babies are too adorable! I love them both so much – and how much fun will it be for both of them once Sailor starts walking?! Sailor often times looks like he has a secret! He’s sporting separates here for the first time! And J now loves to “read” books all by himself! Comes in handy when I need to put his brother down for a nap… he’s getting older, and thus more able to entertain himself. Boom and I are so very lucky. Our boys are healthy and very, very good, laid back dudes!